When using a GridSplitter in a Grid, you often define the Grid so that the GridSplitter is located within its own row (for a horizontal GridSplitter) or column (for a vertical GridSplitter). 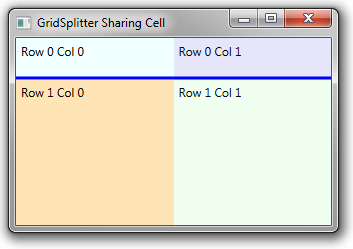 However, you can also place a GridSplitter in a cell with another control. 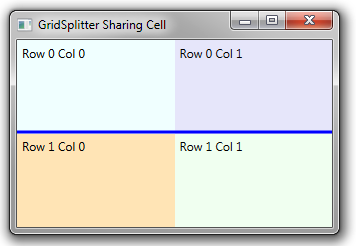 In the example below, the horizonal GridSplitter is placed in the first row (of two rows), with two Label controls. <GridSplitter Grid.Row="0" Grid.ColumnSpan="2" Height="3" Background="Blue"
Note that we add the GridSplitter as the last element in the Grid, to make sure that it shows up on top of the Label that it shares a cell with.